I am always trying to improve on my skills in the kitchen and add some variety to the meals I make for my family! So I am always looking for new recipes, whether from Pinterest, online, recipe blogs, magazines or new cookbooks! One of my favorite cooking magazines is Taste of Home! They always have easy to make recipes that I have added to my cooking repertoire. I was so excited to see that they recently came out with a new cookbook - the Taste of Home Cooking School Cookbook! It is the companion to America’s wildly popular cooking school tradition, attended by nearly 5 million people over the last 20 years. This comprehensive cookbook, available in both print and ebook, brings the best of these sought after Cooking School lessons into your very own home for the very first time. The Taste of Home Cooking School Cookbook is packed with friendly guidance and savvy advice for anyone who takes the time to cook for their family. Whatever your skill level in the kitchen, this instructional cookbook features more than 400 easy-to-follow recipes complete with nutrition facts, which have been expertly tested and selected by Taste of Home, the number one food and entertaining magazine, read by more than 16 million. Plus, the unique “Cheat It” icon indicates especially low effort recipes that offer big rewards! Some recipe and cookbooks contain really complicated meals to make. With two children under 2, I don't have time for that these days! That is why I love the Taste of Home Cooking School Cookbook! They have easy to make, delicious recipes for a novice chef like me! I have time to make these recipes and my family love the meals and goodies it makes! 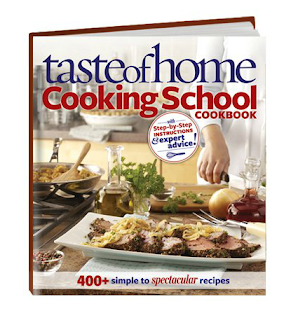 Buy It: You can purchase the Taste of Home Cooking School Cookbook for $19.95 on the Taste of Home website.